Climb High, Climb Safe, Climb On! I have taken thousands of photographs on my climbs so I thought I would enjoy them more by putting my favorites on a mug, t-shirt or even my mouse pad. After people stopped me and asked where I got it, I decided to make them available to anyone thorough the Internet custom shopping site, Cafepress. I have ordered many of these and have been pleased with the quality. CafePress offers a 30 day money back no questions asked guarantee. Click on any image to go shopping! Everest for Kids is available in soft and hard cover book form! This is the same story I have on the site at Everest for Kids. 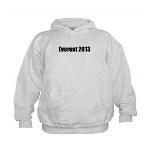 Have a friend or loved one climbing Everest in 2013? Tell the world!! The back of each shirt has a map of the route to the summit. 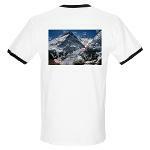 T-Shirts, mouse pads, coffee mug and more with professionally printed Everest images through Cafepress. Click on any image to go shopping!